Addigy, a local Miami software company that helps corporations manage their Apple Mac fleet, is preparing to expand its global reach with the help of Florida International University’s StartUP FIU. Addigy is a quintessential Miami startup with deep roots within FIU. As founder and CEO, I hold a Masters in Computer Science from Florida International University and cut my teeth in the industry managing worldwide sales operations at Kaseya, a major Miami tech company. Three years ago, I left Kaseya in order to devote my full energy on creating and building the first full-stack IT management platform for managing Apple Mac computers. Addigy is a self-funded company based on the sweat labor of extremely talented local Miami talent. The engineering team consists fully of FIU computer science graduates who have immigrated from Cuba over the past 10 years. Addigy was recently honored as one of the Top Ten late-stage Miami startups selected for eMerge Americas two years running and is one of the fastest growing companies in StartUP FIU’s program. Building upon Addigy’s 100-plus customers globally that use Addigy to manage their company’s world-wide Mac networks, the company’s growth is expected to increase significantly in 2017. Addigy continues to expand at a record pace helping customers not only secure and manage the ever vulnerable Macs in their enterprise, but also helping them attract the top millennial talent, some of whom have never used a PC. StartUP FIU is an intensive 14-week accelerator program that rapidly guides entrepreneurs through the paces needed to develop their new business ideas into successful growth companies. The accelerator program is open to FIU students, faculty and early-stage startup entrepreneurs in South Florida. All types of companies are welcome including traditional companies, high-tech ventures and social enterprises. StartUP FIU has been integral to helping Addigy prepare for the next stage in funding and scaling our growth. StartUP FIU has provided us with an abundance of resources at FIU and very deep networks of talent throughout Miami. Our mentor Mario Cruz (director of Watsco Ventures), for example, has been integral in guiding us through critical areas of the Addigy business. There is nothing else like StartUP FIU in South Florida, period. Keep an eye on Addigy as it breaks new ground in Miami and globally in the coming years, as well as the many other great companies being groomed for success in the StartUP FIU Accelerator program in Miami. Jason Dettbarn is founder and CEO of Addigy, a Miami-based tech startup. Pitch Day is an important milestone for the inaugural Empower Accelerator Program cohort. By this day, StartUP FIU teams will have successfully completed the 14-week Empower Accelerator program. They would have participated in nearly 30 presentations and workshops, taken part in critical mentoring and business advice, and presented their required weekly deliverables in preparation for this one day. It will be 8:30 a.m. to 12:30 p.m. on Dec. 6 at the Graham Center Ballrooms on the Modesto Maidique campus. Four-woman team of undergraduate students compete for top prize in social entrepreneurship with help from StartUP FIU. The 7th Annual Hult Prize, the world’s largest student competition whose winner receives a cash prize of $1,000,000 to launch their social venture, this year challenged participants to build a sustainable, scalable start-up enterprise. The emphasis in the 2017 competition is to develop a product or service that will restore the rights and dignity of 10 million displaced migrants, including refugees, by 2022. 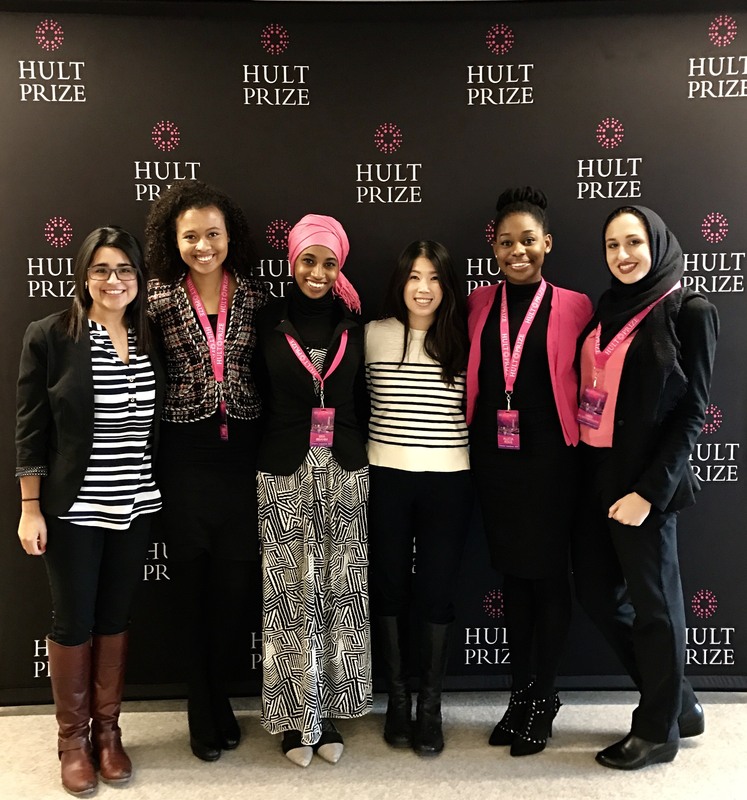 An all-female team of four undergraduate students from Florida International University (FIU) formed the social venture called WeWomen and emerged as the winners of the Hult@FIU competition on December 9, 2016. The win secured them a spot in the Hult Prize’s Boston Global Regional Finals and Cohort 2 of StartUP FIU’s Empower Accelerator Program. “We’re thrilled to be competing in Boston and are grateful for all the support from the StartUP FIU team as well as our mentors, advisors, and professors,” says team member Dorothy Peck. StartUP FIU, which is sponsoring the WeWomen team in Boston, is an initiative to develop and foster innovation and entrepreneurship. Cohort 2 of its Empower Accelerator Program is designed to help FIU students, faculty or staff and early-stage startup entrepreneurs create and grow their traditional or social businesses. The diverse women of WeWomen are: Abeer Albarghouthi, a junior in biomedical engineering originally from Palestine; Isra Ibrahim, a junior in biological sciences originally from Sudan; Peck, a junior in international relations originally from the United States; and Allicia Rolle, a senior in sociology with a certification in women and gender studies originally from the Bahamas. “It’s exciting to see women from different countries and different majors coming together to develop a sustainable business to provide real help for refugees and other displaced migrant women,” says Daniela Cadena, who oversees social entrepreneurship for StartUP FIU and has been the team’s advisor since October 2016. WeWomen is dedicated to solving a real problem for millions of displaced migrants: the lack of feminine hygiene products in refugee camps. Their solution is using leaves from banana trees to produce environmentally friendly menstrual pads. “Menstruation is stigmatized in many cultures,” said Peck. “The pads are also expensive and not seen as a necessity in households where men make all financial decisions.” Women and girls can often miss 50 days from work and school every year, a burden inconceivable to these students who grew up in the United States and the Bahamas. The issue is particularly acute in refugee camps where women have resorted to using soiled rags or garbage that can sometimes lead to toxic infections. “And when periods are seen as a burden, women are seen as a burden,” thundered Peck during WeWomen’s business pitch on Saturday in front of a panel of five judges and peer teams. The team’s business plan involves buying machines invented by an engineer in India to make the pads and obtaining banana leaves from Northern Colombia, another region with displaced migrant women, and employing them to prepare the leaves for export. WeWomen would sell its product in the U.S. market using proceeds from the sale to heavily subsidize the product in refugee camps in Africa and the Middle East. Out of 50,000 applications and 65 Boston Global Regional teams, WeWomen narrowly lost its bid to be named one of the six finalists to Arizona State University’s team. “It doesn’t end here. It’s not a linear path, but entrepreneurs never stop,” said Cadena, who traveled with the team. Ultimately the Rutgers University team won the Boston Regional Hult Prize competition earning them a spot to pitch for the top cash prize in September. https://startup.fiu.edu/wp-content/uploads/2019/01/StartUp-FIU-hrz-Color-rev-ctr_-300x65.png 0 0 startupadmin https://startup.fiu.edu/wp-content/uploads/2019/01/StartUp-FIU-hrz-Color-rev-ctr_-300x65.png startupadmin2017-03-07 11:55:392017-03-07 11:59:09Four-woman team of undergraduate students compete for top prize in social entrepreneurship with help from StartUP FIU.